Tonight, as he claps closed his computer, Husband will hustle out of the door straight to a dinner at a DC dining establishment. No other halves allowed (it’s business, not pleasure), so I’ll be on my tod this evening. Naturally, a night alone is no biggie at all (it’s a chance to catch up on The Hills, is how I see it), but it did get me thinking about loneliness in general. Who can have missed the headlines that hit after the recent publication of Emily White’s memoir Lonely? White’s story was stark, and struck some serious chords: a 30-something successful lawyer, her life was left in total tatters when chronic loneliness suddenly set it. Odd this: it’s easier than ever to be ‘in touch’ these days, but still loneliness looms large as a social scourge. People can have scores of pals in online portfolios, but lack the real people you can pester in the middle of the night for a weep and a moan. To make matters worse, loneliness is still tarnished as a social taboo (White couldn’t admit to her situation, and often fictionalized a social life in the presence of her colleagues). 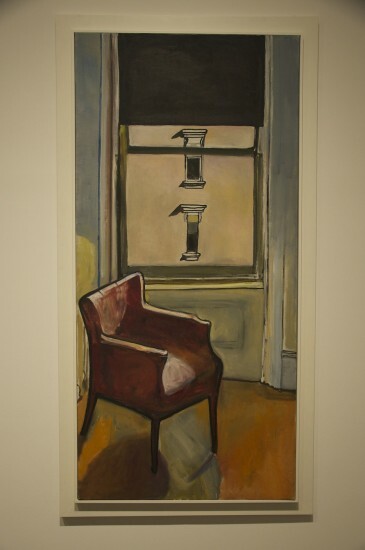 One artist at the NGA not afraid to face her loneliness is Alice Neel (1900 – 1984). 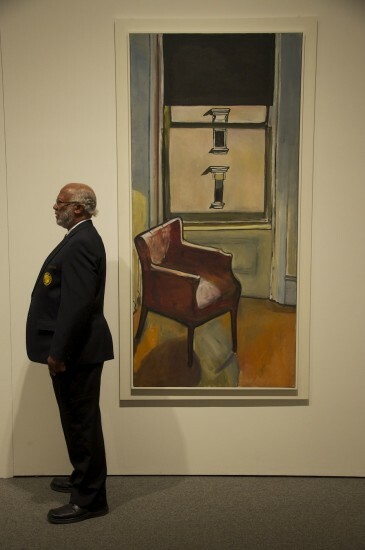 Born in Pennsylvania, Neel attended the Philadelphia School of Design for Women. She married the Cuban painter Carlos Enriquez in 1925 and the pair lived in Havana for a time, an experience that awakened Neel to the artistic avant-garde and sparked her life-long political consciousness. Two harrowing thorns stick out in Neel’s personal history, thorns that went on to shape her art. She lost her first daughter to diphtheria within a year, and her second daughter (born soon after in 1928) was taken to Cuba by Enriquez in 1930. Neel suffered a massive nervous breakdown soon after. 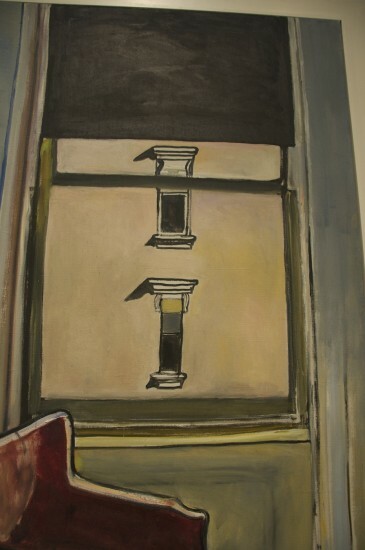 Once recovered, she started to steep her art in the trauma of losing the girls and her husband: anxiety, loss and loneliness were dominant themes throughout her career, as is clear in Loneliness (1970), our painting for today. 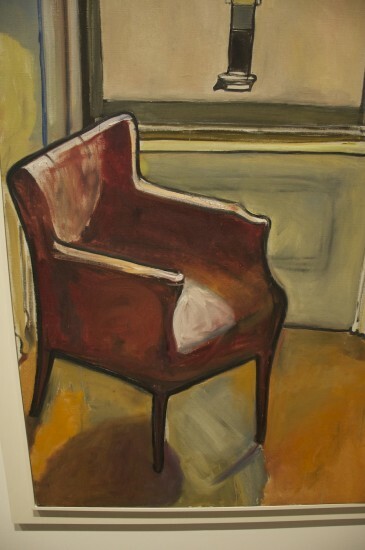 The work shows us Neel’s expressionist use of color and line: a blood-red chair sits against sickly yellow. On the floor and walls, patches of paint blotch across the surface, while that black blind hangs heavy and oppressive, overhead. That black picks out the outlines, clear against the bright colors, outlines that seem to seek concreteness or containment. Loneliness has strong psychological sting. There’s the suggestion of voyeurism, of looking achingly at the (social) lives of others. There’s the pang of absence too, in that eerily empty chair. So it is that in this simple scene, the emotion is as thick as the brushed-on paint. Towards the end of the 1960s, Neel’s star had started to rise (by the 1970s she was seen as an important American artist). It’s key to see that, even at the height of her career (in which she worked principally as a portraitist), she still returned to her core-concern themes. I suppose the thing is that there’s a line between ‘loneliness’ and ‘alone’. If you’ve friends that can be fetched fast from the wings, you’re unlikely to feel lonely, even if alone. In fact, in these super-connected times, it’s not bad to practice being by ourselves. But, if there’s an inability to communicate with others, that’s when loneliness starts to set in. And that’s the sensation that radiates here, in the vacant chair and those blind windows. Disconnectedness is everywhere. mental diseases, suicides, and even anti-social behaviors originate in this loneliness, a part of the human condition.